WordPress is a powerful open source content management system (CMS) used to build stunning Websites. 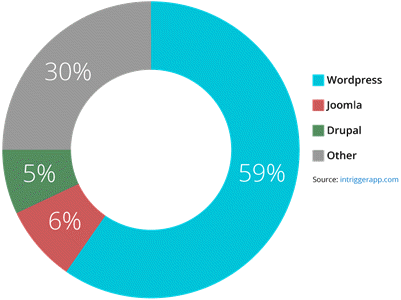 The most recent figures indicated that there are over 70 million WordPress sites around the world. It is free to use, deploy, and upgrade and has thousands of plugins and templates providing both power a flexibility while reducing the cost and deployment time of a new site. The developers at Net Solutions have years of experience developing client sites with WordPress and accumulated knowledge and resources to deploy high quality websites. WordPress is perfect for Business Websites. It’s Open Source with room for expansion and is highly customisable, once only available in expensive enterprise. There is a reason why it has become so popular and taken over the market share, because it meets the demand of many users with its flexible framework to allow designers and developers to create and modify layouts and applications without the need of a huge budget. The robust features have attracted many of the top brands including but not limited to: Time Magazine, Google, Facebook, Sony, Disney, LinkedIn, The New York Times, CNN, eBay, and more. WordPress is open source which means it is free to use and the code is open for everyone to use. It is supported by a large group of volunteers majority of whom are WordPress consultants with active interest in growing and maintaining WordPress. You won't be locked in to using a proprietary system with no room to grow. If you want someone experienced to setup your WordPress site, then our talented staff members are happy to help you get started. Our team have extensive WordPress experience and we have custom developed many plugins and themes in order to meet unique demand of our clients. How much will my WordPress site cost? We've built many WordPress websites and costs ranged from under $2,000 to over $20,000. Providing an estimate is complex because you are always dealing with unknowns, features forgotten about, left out or not considered until some time into the development. Nobody wants to get ripped-off, so an estimate establishes a baseline based on a number of assumptions. If the assumptions are as expected then the final cost won't deviate too far from the estimate. We will always let you know early on in the project if there are any red flags. We qualify the requirements by further refining the estimate by gathering data and analysis of your business requirements. This requires some time and will provide a clear statement of works and more accurate final cost estimate. We determine the type of theme required and the necessary software required to commence building your site. A theme is a collection of files that work together to produce a graphical interface with an underlying unifying design for a Website. The theme governs the way the site is displayed on various devices, such as Desktop PC's, Notebooks, Tablets, Phablets and Phones. The design of the theme therefore is one of the biggest decisions you will need to make when building a new website. If you opted for a custom designed theme, that adds an extra layer in the development process and requires a mix of resources including graphic designers, project managers and software developers and the lead time needs to be significantly increased based on your scope. Net Solutions will drive the process and co-ordinate the resources required during the project design phase. If you opted for a Pre-Designed theme there will be no need the design component. A choice of a pre-designed theme will be selected and used to develop the site. A link to a functional demo of three (3) pre-designed responsive themes will be sent to the client. Client is to select one of the three (3) themes to be used for their site. If none of the three themes are deemed suitable then a list of themes will be provided for the client to choose from. All our development work is performed on a staging server and we provide you with a private URL so you track track and see the progress of your site live. We then work through configuration of your site and add your content. When you approve the completion of the work, we migrate the site live to our hosting platform as aprt of the handover. Functional Requirements – These define how a product/service/solution should function from the end-user's perspective. They describe the features and functions with which the end-user will interact directly. Technical Requirements – These define the technical issues that must be considered to successfully implement the process or create the product. Transitional Requirements – These are the steps needed to implement the new product or process smoothly. The theme governs how your site will look. Themes can be purchased off-the-shelf or can be designed from scratch. The cost difference between the two options is significant. A pre-designed theme may be a good choice if you have generic requirements or have a strict budget to work within. Pre-designed themes are purchased off-the-shelf and can generally be customised to,meet most requirements. They are already fully responsive and eliminates the need for a team of designers, so the effort, time and costs are greatly reduced. With the business requirements now understood we have a clear scope of works. Our developers now have to look at the software required to fulfil the requirements. Membership Subscriptions, Appointments, Calendars, Contact Forms, Shopping Carts and ECommerce Advanced Security, Social Integration, Bulletin Boards, Forums, Chat Support, Order Forms, Media Gallery, SEO Management. The Development process starts here and happens behind the scenes. But this does not mean you cannot track the progress of your investment. We manage our own hosting environments, so we setup a staging site with a private URL. You can visit the URL and visually see and your site while its being developed.. When it is safe to do so, we can give you login access so you can test and examine some of the features in more detail. Configuring your site starts with your theme and layout. Implementing the right layouts, colours and fonts. For more complex sites, this activity extends to third party sites such as payment gateways, shipping gateways, mail subscriptions sites, social networking sites, and third party API's. We migrate the development site to our production server and your new website is now live! We also provide a WordPress maintenance service. This is a pro-active service that ensures your site is running error free, by performing regular software updates, database optimisation, daily offsite backups etc. We consider this service almost mandatory these days so that the website remains highly secure and has the best protection available against hackers.